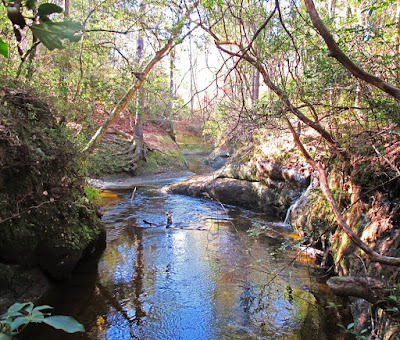 Here is a list of the unexpected surprises that I encountered as I hiked the rest of Econfina Creek, between the Scott Road Trailhead and Strickland Road. 1. Vertical-walled bedrock canyons. As mentioned in the caption above, there is some resemblance to the Virgin River in Zion National Park, Utah. This was not something I signed up for when I decided to hike Florida, but there it was. For a mile or so, Econfina Creek cuts a deep narrow channel out of the rock. I don't know if it's prone to flash floods, but when it rains hard the water rises fifteen feet or more. 2. Waterfalls? Florida is flat, no? Highest elevation in the state is 345 feet. Econfina Creek showed me several waterfalls. If you missed it, there's a nice one in the shot above. Here's a clearer view. 3. Mountain Laurel, denizen of the coolest, shadiest, steepest slopes in the high Appalachians, growing beside Bald Cypress - denizen of the hot, steamy southern swamps? No way. Yes way. There they are, together in one photo--a bald cypress growing in the bedrock against the north-facing vertical bank where Mountain Laurel bushes are practically touching its trunk. 4. Throw in a sandy beach. What more could a hiker want in one twelve mile hike? 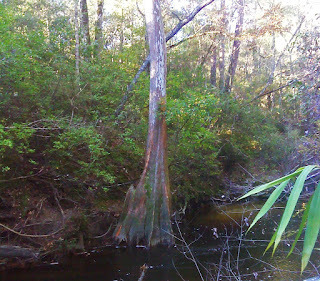 Did you notice the cypress knees in the background beyond the beach? Trees with knees - they're certain to please. That knee shot was taken farther downstream where there was a boggy flood plain. 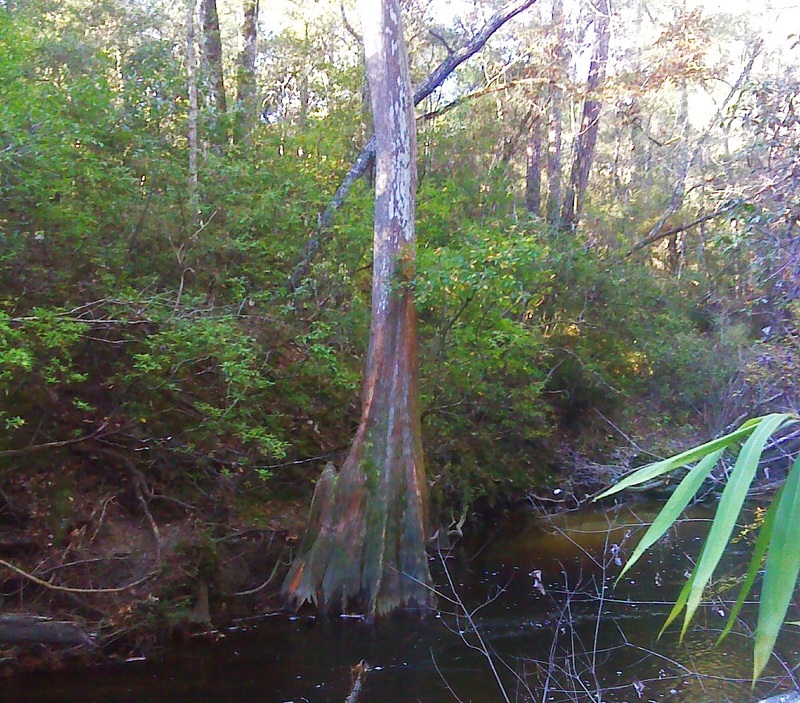 The Florida Trail follows the banks of Econfina Creek for about ten miles from where it's a small upland stream tumbling over its bedrock bed . . .
. . . though the slot canyon with its flood-scoured walls, to the languid currents of the sandy coastal plain. And there are countless viewpoints and access points, even two sturdy suspension bridges. Here's where I stopped for lunch. 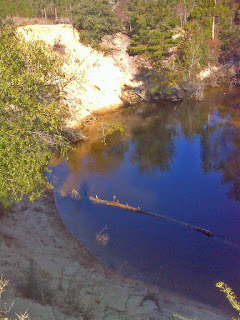 And farther down the stream spreads out and begins to meander, cutting deep into the soft sand banks. One stream, in ten miles, showing three distinct personalities. Geological diversity - the unexpected bonus. This was a 'money' day. I came away enriched, energized, enthralled. I've been that way for the past week. Whatever the trail has in store for me as I continue east and south, I will be comparing it with Econfina, Nokuse, and Pine Log. And whatever I encounter I will remain grateful for these enchanted days. Below is a map of the Econfina walk, and with it are links to many more photos.